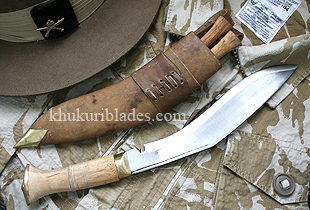 New Jungle Warfare kukri for Gurkhas serving in Afghanistan. New color handle and leather. Why the name Jungle Afghan. Well credit goes to a Gurkha soldier serving in the 2nd Battalion Royal Gurkhas Rifles stationed in Afghanistan. This combatant was looking for a Jungle kukri to match his desert color uniform, and at the same time be more durable. The regular Jungle that is always in black horn handle and black leather scabbard was not really matching with his uniform, he complains. Even when he tried to camouflage it with his uniform color cloth, it wasn’t strong enough as it ripped easily within a few days due to water, sweat, sand and excess friction of the belt and uniform. To solve this Gurkha’s problem, KHT (Khukuri House Thamel) decided to make a unique Jungle. No alteration was brought to the blade as the shape and the size stayed the same but the handle and the color of the leather used was changed. Now this Jungle Kukri has a white yellowish color wood handle and new color leather that matches the uniform. The delighted soldier was not only happy with the color but with the durability also and complemented that his Jungle kukri would be the next issue for serving in Afghanistan.